Getting your foot in the door for an interview at a restaurant is actually fairly simple. 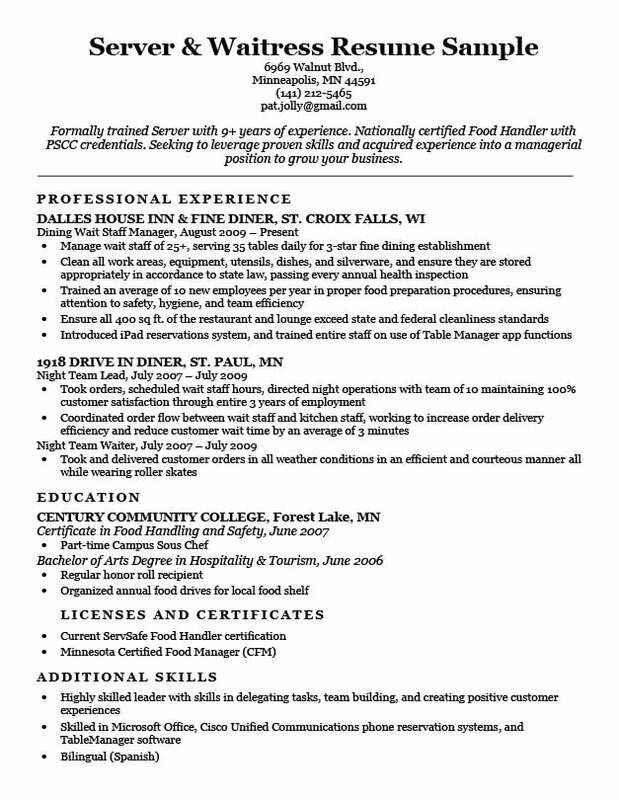 Pay close attention to this server/waitress resume sample and our writing tips, and open up more doors of opportunity. If you’re worried about running out of time, try out our free, easy-to-use resume builder to craft your resume. Ready to move on? Check out our expansive cover letter collection for some extra pointers. Formally trained Server with 9+ years of experience. Nationally certified Food Handler with PSCC credentials. Seeking to leverage proven skills and acquired experience into a managerial position to grow your business. Server resumes are an interesting combination of customer service, food service and hospitality industries and may lean towards one more than another depending on your previous experience and what job you are applying to. Incorporating transferable professional skills are important for making a truly effective Waiter resume, which the above resume does well highlighting relevant certifications, managerial skills, customer service skills and software knowledge. The diversity in their experiences and knowledge make them attractive to a wider variety of food service industry employers. Incorporating transferable professional skills are important for making a truly effective Waiter resume. To make your resume stand out, highlight relevant certifications, managerial skills, customer service skills and software knowledge. Restaurants, diners, hotels and cruise ships are always on the lookout for talented servers and waiters, so optimizing your resume for the position with the following tips is all it takes to get your foot in the door. By incorporating the following resume builders into your resume you’ll soon be on your way to making more money. Our online resume maker can save you time on your job hunt. Try it for free! A career objective helps target your resume for a specific position by highlighting industry relevant skills and knowledge. In the case of the humble waiter, your career objective should highlight waiting experience as well as food certificates and management experience if you have it. – Formally trained server with 10+ years of experience and 5 years of management experience. Looking to leverage proven managerial skills with a reputable establishment such as (insert restaurant name). Conversely, if seeking a bar/drinks oriented position, mention knowledge of cocktails and multi-tasking skills. If seeking a front desk position highlight customer service and communication skills, as that position focuses more on customer satisfaction than others. Adapting your resume to a specific position is key when targeting a new job. Remember, triple check for grammar and spelling, as these are the most common ways most resumes end up in the trash. Everyone knows the food service industry is one of the more tightly regulated industries in the world. There are a plethora of food safety certification authorities at all levels. Seriously consider taking courses and attaining some of these certifications to better qualify you for a position. Certifications are broken down into State level, National level and International Private levels. For example, attaining the Foodservice Professional certification will help you no matter where in the country you are applying. There are a plethora of food safety certification authorities at all levels. Seriously consider taking courses and attaining some of these certifications to better qualify you for a position. Alternatively you could seek Food Service Manager Certification, HACCP Certification or Food Handler Certification from the National Registry of Food Safety Professionals. This organization allows for online learning so you can earn these credentials from the comfort of your own home! Additionally, most states offer state-level certification programs. If you only plan to work within the state you reside you may be better off pursuing these more localized programs. Simply Google Search your State and “Food Service Certification” and you will be able to find what you need. These programs are usually run by (insert state name)+Department of Health Services”. Finally, consider pursuing a non-state affiliated certification program, as some of these are more popular than local or regional certifications and many employers will even pay you to attend the classes and get the certificates. The largest private certification body in the U.S is ServSafe, and they also allow for learning via online classes, where you can earn a variety of certificates ranging from food handling to alcohol serving. Investing in industry specific education is always a great idea! Restaurants, diners, hotels and cruise ships are always on the lookout for talented servers and waiters, so optimizing your resume for the position is all it takes to get your foot in the door. Check out our expert’s guide and list of 135 resume adjectives for more details. With the above tips you should be able to cook up an irresistible resume for any sever/waiter position. For more detailed tips on how to become a waiter or waitress the good folks at Gradspot offer a nice resource on the subject. For a list of schools and community colleges that offer waiter/servicer specific education check out Education-Portal.com, as they list out schools across the country specializing in food service positions. Remember, every job is unique, and every applicant is different, so some applications may call for differently formatted resumes. Learn more about sending multiple resumes here. Need a cover letter? 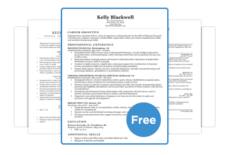 Try out our intuitive cover letter builder featuring 40+ unique templates. Didn’t get the specific answers you wanted from this page? Please leave a comment with your question.